Like my fellow travelers, I wrote a reflection which I tossed aside as I asked the same question posed at the end of Susan’s photo montage we just saw. Like David, I didn’t know, I did not know, but now that I do, what can we do? 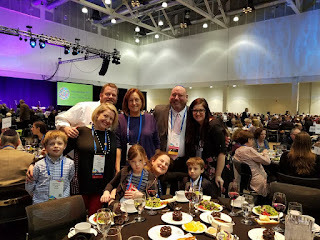 Over the years, Ellen had noticed discomfort among many with the wording in Aleinu L’shabei’ach (it’s on us, to praise), the prayer at the end of communal worship. We bow in acknowledgement that we have a unique obligation, that we are not the same as others, that we are special; many have seen this as chutzpa-dik…a holier than thou kind of statement. Perhaps this is not about privilege, says Ellen, but about responsibility. I hope these new words and melody may help to give us new meaning as we follow this with our traditional chanting of Aleinu. The words are in your handout. Twice this year I have stood surrounded by my people. 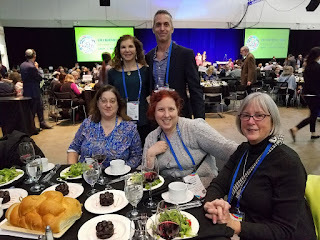 Once secular, at GenCon (largest tabletop gaming convention in North America), and once spiritual, at the URJ Biennial in Boston this past December. There is an indescribable joy in being surrounded by those who understand you and whose stories are like your own. We all experience it on a small scale at services and temple events. It is something else when it is at a convention hall full of people. It is easy to forget, living in the Northeast, how few we are. We should embrace the opportunities we have to congregate. well attended and spiritually uplifting. Though the Friday service, with its 6,000 attendees, was an experience, my heart belongs to the smaller services. 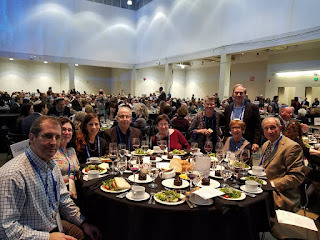 It amazed me to see the variety of ways that Reform Jews worship. I even saw both men and women wearing tefillin. It reminded me what differentiates us from the other Jewish movements, and what makes the Reform movement so exceptional and welcoming. The classes varied widely and covered all aspects of synagogue life. They ranged from diversity and inclusivity to finances. If anything, there were too many good options to choose from. That’s not to say all were perfect. I went to seminars that inspired and ones that I could have slept through. This happens at all large conventions where you have a variety and depth of speakers. What is important to me is that that I left most of them with something useful or a new insight. I don’t know that I’ll go to the biennial in Chicago, but I would not miss another opportunity to attend a biennial so close to home.